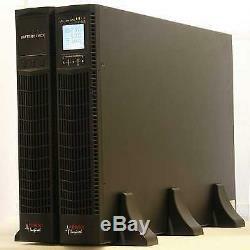 3000VA / 2700W Fully Featured Online Double Conversion Uninterruptible Power Supply. The VFI3000B is a professional grade Uninterruptible Power Supply (UPS), for high end IT and telecommunications systems, or other mission critical applications where the highest levels of power protection are required. It has a full array of features making it a no compromise UPS Solution. The unit contains 6 internal 12V 9Ah batteries in a hot-swappable battery tray, allowing for battery replacement without downtime. 2U Rackmount design, or vertically standing with supplied support brackets. Runtime can be extended by the addition of matching cabinets. Comprehensive LCD display which can be electronically rotated to suit orientation. USB and RS232 ports for software connection. Frequency Conversion Mode, can convert 50Hz to 60Hz output. Wide Input Voltage range from 110V to 290V without reverting to battery. Configurable Voltage Output - 208/220/230 or 240V fixed and unwavering. EPO (Emergency Power Off) Terminal, suitable for industrial applications. High Capacity Power Output with 0.9pf providing 30% more real power than other systems. High Input Power Factor of 0.99, ensures no penalties for poor power factor loads. ECO mode operation to reduce operating costs. Hot Swappable Battery Design for zero downtime during maintenance. Intelligent Accessory Port for SNMP or AS400 cards. Load Shedding Feature allows a bank of not so critical items to be shut off first to extend runtime on the critical load. Software for Windows, Linux and MAC. For full specification and manual download, visit. You may like to use our. On our website to help you choose a UPS thats right for you. We offer Next-working-day service (applicable to UK mainland addresses) and we use Interlink Express and UPS as our couriers. We're experts in Uninterruptible Power Supplies. We will give you honest, practical advice and ensure our listings are as accurate as possible. Our specs are honest and not misleading. The biggest misleading specs that you need to look out for are. Quoting Runtime without specifying the actual load in Watts. To compare UPS runtime you just need to compare the battery capacity. Quoting Capacity in VA and withholding Watts. VA ratings for UPS is now more or less obsolete but carries on regardless. The real capacity is Watts and you should look this up. Choose Watts not VA when comparing systems. 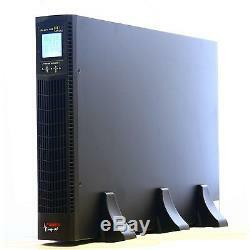 3000VA 0.9PF (2700W) Rack / Tower Online UPS System" is in sale since Monday, June 27, 2016. This item is in the category "Computers/Tablets & Networking\Power Protection, Distribution\Uninterruptible Power Supplies". 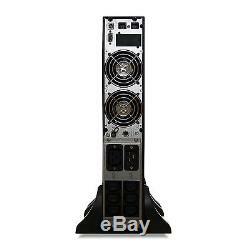 The seller is "upsrus" and is located in Bicester. This item can be shipped to all countries in Europe.